To secure the date, a signed contract must be accompanied by a down payment of $2000 PLUS tax. This amount is non-refundable. The remaining balance AND a security deposit of $500 are due 1 month prior to the wedding. Please note that the security deposit is not taxed. Assuming responsible cleanup and no additional costs owed, the security deposit would be returned to you after the wedding. 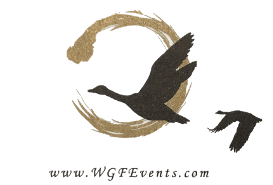 Wild Goose is perfect for celebrations of all kinds – Quinceanera, anniversaries, retirement parties, etc. It would also be a great site for your fundraising event, corporate meeting or training seminar. Please contact us for rates and more information. We’d love to know more about your event and event needs in order to better accommodate you. A current certificate of commercial general liability insurance naming WGF Events LLC as an insured party (or other comparable broad form general liability coverage for bodily injury, personal injury, and property damage claims) in the amount of One Million Dollars is required. Additional liability waivers or supplemental insurance may also be required depending on the scope of the insurance, the venue rental period, and the activities planned for the event. It is the responsibility of the renter to identify one event coordinator or another individual as the sole contact. Agreements cannot be transferred or assigned. Wild Goose is a NO SMOKING venue. Renters and their parties shall observe all posted signs for parking and driving on the property. No open flames (fire pit, bonfire) without permission. No swimming or fishing in the ponds. Livestock must not be disturbed. No nails or paint. The structure and decor of the Barn cannot be altered. Without prior approval, all events must end by 11:30 PM. Town ordinance prohibits loud outside music.